The world-famous 'Palace on the Glen' needs no introduction. 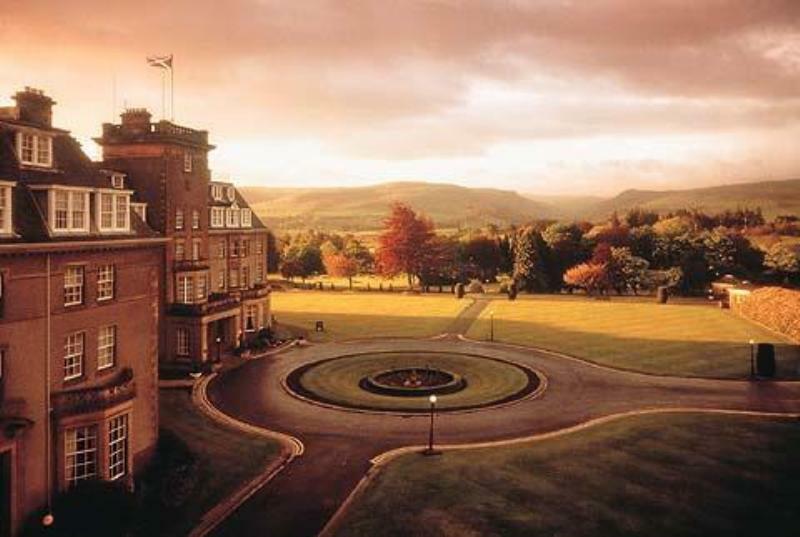 Arguably one of the best-known golfing hotels in the world, Gleneagles also offers myriad sporting pursuits, a high-class spa and plenty of possibilities of you are looking for food and drink. Strathearn is the hotel's number-one dining room, and it oozes old-school grandeur. Roasts are carved from the trolley, chateaubriand with pontneuf potatoes and béarnaise sauce is a bestseller and there is much dramatic flambéing at the table. That said, the kitchen also takes on a few more contemporary challenges in the shape of carpaccio of Scotch beef with rocket and aïoli, fillet of halibut with herb gnocchi, pea and foie gras velouté, smoked Caithness lamb or roast loin of venison with pear Tatin and sauce grand vineur. Desserts could span everything from classic peach Melba with framboise sabayon to warm Manjari chocolate and walnut pavé with Armagnac cream; alternatively, finish off with a true country-house savoury like devils on horseback. Vegetarians have their own menu and the restaurant sports a noteworthy wine list, as well as a fascinating collection of rare malt whiskies.